Concerta is a stimulant medication used to treat attention deficit hyperactivity disorder and narcolepsy. Many people abuse the drug to get high, boost energy and focus or to lose weight. People who abuse Concerta often take many pills at once. They may crush and snort them or mix them with fluids and inject them. The drug is addictive and can lead to many harmful side effects such as depression, insomnia, muscle aches and body temperature fluctuations. Potential signs of an addiction to Concerta include taking more of the drug than planned, an inability to cut down on use, withdrawal symptoms and tolerance (needing to take more of the drug to feel the same effects as before). Who Answers? to get information about treatment for Concerta addiction. A representative is standing by to assist you. Concerta is a brand name for the prescription drug methylphenidate. It is often prescribed to treat attention deficit disorder (ADHD) in children, adolescents and adults. It may also be prescribed to treat narcolepsy. Concerta is a central nervous system stimulant. It increases heart rate and blood pressure as well as brain activity. 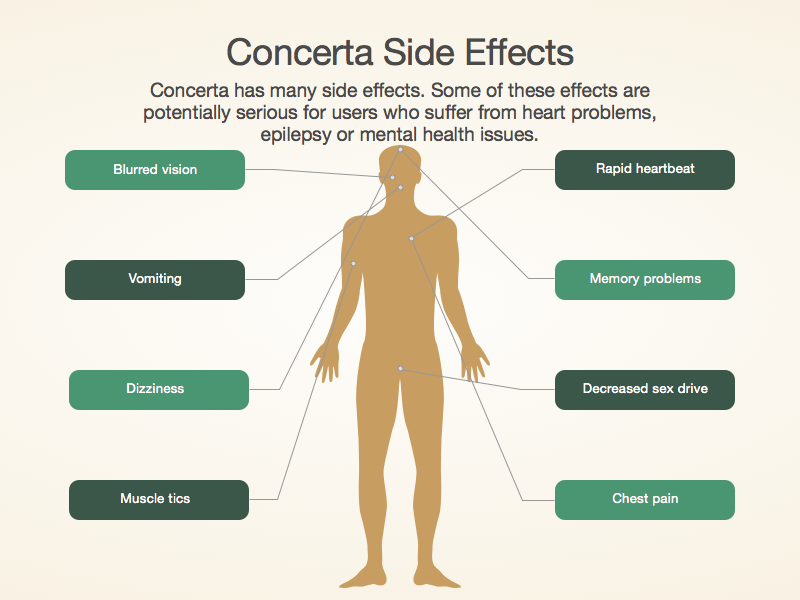 Concerta is often abused recreationally for its effects of euphoria, alertness and improved sense of well-being. Additionally, people abuse it in order to increase energy, focus, performance, attention and weight loss. People who misuse Concerta often take many pills at once. They may crush and snort them or mix them with fluids and inject them. This speeds up the onset of effects and/or intensity of the high. But it also greatly increases the risk for addiction, tolerance development and withdrawal symptoms. Concerta’s effects are caused by an increase in dopamine activity in the brain. Dopamine helps regulate movement, attention and the pleasure/reward area of the brain.When someone abuses Concerta, an excessive amount of dopamine floods the brain, resulting in a euphoric rush and a reinforcement of the drug use behavior. 12-step programs. You meet with a fellowship of recovering addicts to share your experience and receive support. Dual diagnosis treatment facilities. These facilities specialize in treating a Concerta addiction and a co-occurring mental or physical health condition. Inpatient or residential rehabilitation centers. You live at the treatment center while going through a structured program that includes detox, group and individual therapy, and possibly 12-step meetings. This option is best for severe Concerta addictions because it separates you from the using environment and allows you to focus solely on your recovery. Outpatient rehabilitation centers. For those who can’t abandon school, home, or work responsibilities, this is the best option. You can live at home while attending treatment a few days a week around your schedule. Finding the best treatment for your Concerta addiction means that you must consider a number of different key factors and educate yourself on the treatment process for an addiction to Concerta. Everyone responds to treatment differently; what works for one person may not work for you and vice versa. It’s important that you do some research before choosing a rehabilitation center. You or your loved one will be more likely to get the most out of your rehab and experience and increase your chance of long-term sobriety. Make sure that the treatment facility has certified mental health professionals who will create a comprehensive aftercare program for you as well. This will help to prevent relapse and promote long-term sobriety. The duration of the treatment program. The kind of treatment program. What amenities the facility offers. If you have insurance, call 1-888-319-2606 Who Answers? to learn more about your insurance policy and how much it covers. Many insurance companies provide full or partial coverage for addiction treatment. If you don’t have insurance, call the Substance Abuse and Mental Health Services Administration’s toll-free helpline to learn more about finding a rehab program without insurance. Additionally, you can search on a health insurance marketplace for affordable insurance options. Those with ADHD experience increased attention and an improved ability to focus when they take Concerta. But those who don’t have ADHD can experience an increase in energy and euphoria when they misuse the drug. The effects of the drug will peak approximately 1 to 2 hours after administration.2 These effects can last between 4 to 6 hours for the immediate-release form of the drug, and between 3 to 9 hours for the extended-release form. Concerta can also be dissolved into a fluid and administered intravenously. When this method of delivery is used, the effects are far more immediate; they peak around 1 to 3 minutes after its administration. Concerta use can cause sudden death in adults and children, especially in those with heart problems and defects. Concerta use can also complicate pre-existing issues such as heart disease and epilepsy as well as some mental health conditions. People with these conditions should be especially wary of abusing stimulant medications such as Concerta. Generalized myalgia (widespread muscle aches). Marital, familial or personal difficulties. While medically supervised detox is not absolutely necessary, it is suggested you seek medical assistance due to major depression and suicidal ideation. Depression that resembles a major depressive episode. Who Answers? to speak to a treatment support specialist about rehabilitation options near you. Addictions tend to get worse the longer they go untreated. Taking more Concerta than originally planned or for extended periods of time. Unable to quit using Concerta or to cut down use. Spending an inordinate amount of time getting Concerta, using it and recovering from its effects. Intense cravings to use Concerta. Negative consequences at work, school, or home from Concerta use and continuing to use anyway. Social and interpersonal problems exacerbated by Concerta use and continued use regardless. Forgoing activities or hobbies in favor of Concerta use. Consistently using Concerta in physically dangerous situations such as driving or operating machinery. Continued Concerta use regardless of a physical or psychological problem caused or aggravated by Concerta use. A 2009 review of the literature reported that annual Concerta abuse is at an estimated 4%. It also revealed that of college students abusing Concerta, the population with the highest prevalence of abuse is white, male, affiliated with a fraternity, and more likely to abuse other drugs. Overdose can occur with Concerta, resulting from overstimulation of the central nervous system. Overdoses of stimulant medication can lead to very serious heart problems or even death. If you or someone you know may be suffering from an overdose of Concerta, call 911 or visit the local emergency room immediately. Tachycardia (dangerously elevated heart rate). 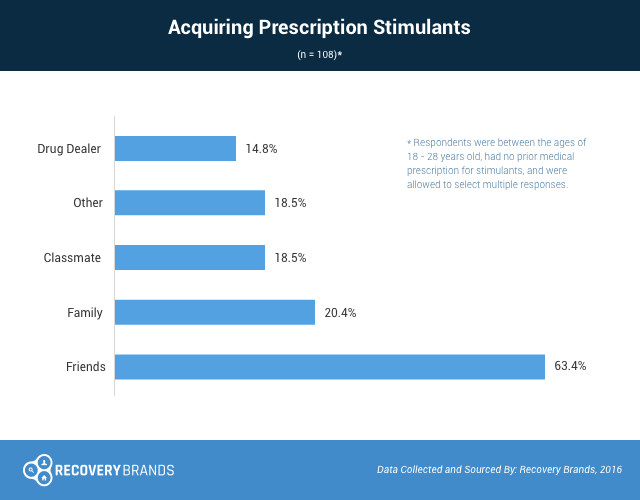 Where Do Young Adults Get Prescription Stimulants? Many young adults can get stimulant medications despite not having a doctor’s recommendation. But where do they get access to their drugs? A survey that Recovery Brands conducted in 2016 revealed that more than 60% of men and women between 18 and 28 years old get ADHD medications via friends. More than 20% get them from their family members, almost 20% from schoolmates, and more than 14% through a dealer. People with a prescription can protect young adults from the consequences of misuse by keeping track of their ADHD medications. If you or someone you love is struggling with Concerta abuse, and you need information about effective substance abuse treatment options, call 1-888-319-2606 Who Answers? to speak with one of our treatment support specialists.
. Morton, W., & Stockton, G. (2000). Methylphenidate Abuse and Psychiatric Side Effects. Prim Care Companion J Clin Psychiatry 2(5): 159-164.